Happy Fall, y’all! Giving kids a hands-on project really helps them celebrate the seasons. I hope you enjoy this engaging fall STEAM activity that incorporates science and art to create a colorful fall scene! Since we live in San Antonio, we do not have the traditional fall, though our weather is quite beautiful once summer finally lets go. A few trees lose their leaves but there is not a great leaf-changing-colors event that paints the wooded areas. So when my friend shared this super easy and fun way to create our own fall leaves, I was really excited to try it. Our printer is on the fritz so I had to freehand sketch our leaf templates. But you can make it easier on yourself by downloading and printing the leaf template she provides in the project post. I decided to take the original project a little deeper by adding a bit more science into the mix and creating a larger art project using the leaves we made. I encouraged experimentation with mixing different colors to make other colors. Although my son already knows that red and blue make purple, it was really fun to watch the red and blue markers blend on the coffee filter as the water absorbed through the colors. We also tested whether or not creating different patterns impacted the final product. We discovered that it didn’t but it was fun to try! And it was a great lesson to show that not all experiments turn out exactly the way you think. Finally, I put the water in a measuring cup and had Ace hypothesize as to what would happen to the water level after we were finished with the project. He learned that the level went down because the water was being absorbed by each coffee filter. Plus, we were able to see how much water was used for our little project. The first episode of the show discusses pointillism and the characters create their own masterpieces using that particular technique. Ace has been asking to paint using pointillism so I thought this project was the perfect time to try it out. I decided to have Ace create a fall tree scene using pointillism (we used pom-poms and q-tips to paint the dots). We ended up using a coffee filter for the sun and cotton balls for clouds. Then we glued our leaves to the painting. As a special bonus, I actually got to create a picture too because we had so much leftover paint and so many leaves! I rarely ever get to create something of my own so I was excited to be able to participate. All-in-all, this project was a huge success for us. It ended up taking the better part of the day because each step needed time to dry before we could move on. But you could easily stretch this project over a couple of days if you didn’t have a big block of time available. I liked creating this project so much that I think a wide range of ages could enjoy putting it together. The younger the child, the more help they will need with certain steps. We used washable markers on the leaves but I think it would be interesting to try other mediums such as water-soluble paints (but not as thin as watercolors) or non-washable markers to see whether you could get bolder results. 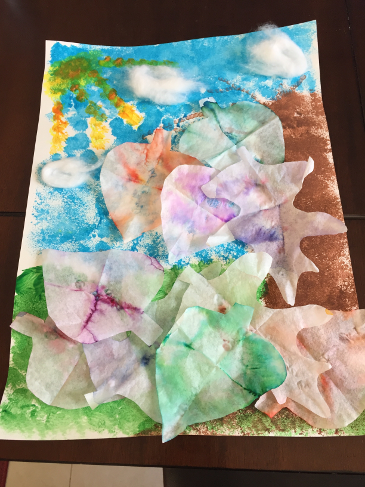 Older students could also choose to skip the water absorption step and just paint the coffee filters with watercolors or other paint to get the design and color hues that they want. You could even choose to create the background image using markers or small paintbrushes to create the dots à la Seurat. Whatever you choose, I hope you have fun creating your own fall scenes. I would love for you to share pictures of your finished products in the comments below! Create as many coffee filter leaves as you want. While the leaves are drying, paint your background image on your paper, cardboard, or cardstock using pointillism. When the paint is dry (or mostly dry), glue the clouds and leaves to the painting. Don’t forget to layer the leaves for a wonderful 3-D effect! Love this! We actually just got dot markers for our 2-year-old. I didn’t even think about it but basically she is using pointillism! Now we have a fun season-based craft to create! I have always wanted to get dot markers!! That would be a great way to make the backdrop for this project! Thank you so much! 🙂 We had so much fun doing it I knew I needed to share it here.